What interesting things have you all been up to this week? 🙂 I’ve been busy in the kitchen, whipping up your latest treat to indulge in! I made these super easy sweet potato boats the other day, for lunch, and they turned out better than expected! So many flavors, in one bite! 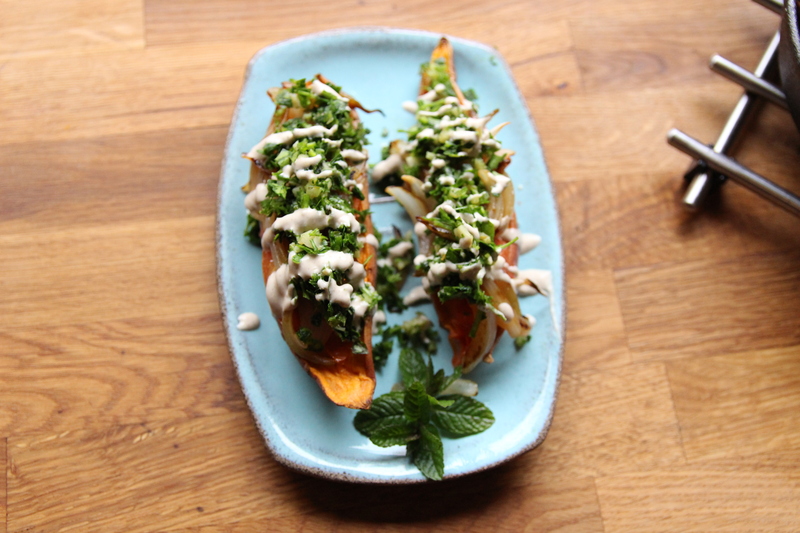 These gorgeous sweet potato boats are baked with a pinch of black pepper, a drizzle of my lemon infused olive oil, and generously topped with caramelized onion slices. Sounds appetizing, right? It gets better! To finish, I added some freshly chopped parsley, garlic cloves, and mint leaves, and drizzled a bit of whole grain tahini on top of all that goodness. Preheat the oven to 392 degrees F (200 C), then cut the sweet potatoes in half, and place them on a baking tray, lined with baking paper. For this recipe, I used my lemon and thyme infused olive oil, as it adds an extra zing to the dish! 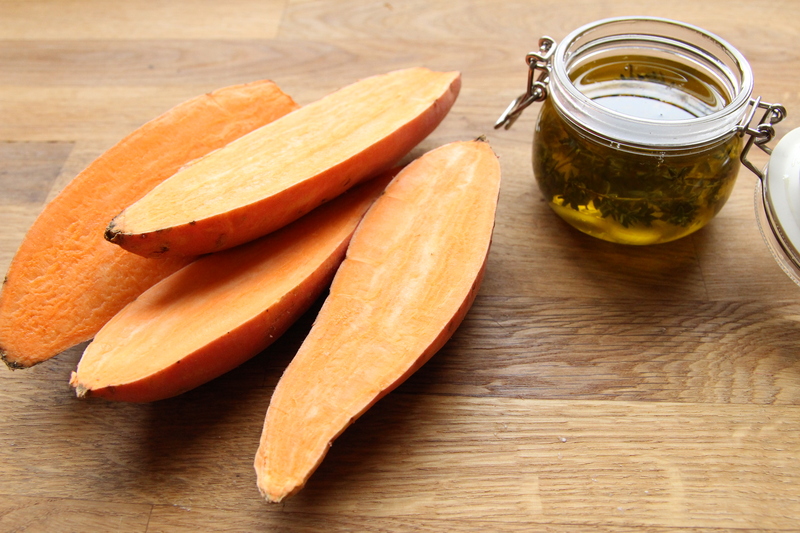 Next, lightly brush the top of the sweet potato with the infused olive oil, add a pinch of black pepper, and pop the tray into the oven for around 20 minutes, until the sweet potato softens. Wash, and slice the cherry tomatoes into quarters, and set aside, while we caramelize the onion. Peel the onion, cut it in half, then, lay it flat on your chopping board, and slice into long strips. Next, heat up a pan, and add a tablespoon of infused olive oil, along with the sliced onion. Occasionally toss, until they start to brown, then transfer to a bowl, and add the cherry tomatoes to the same pan, to saute, for a couple of minutes. Wash and dry the parsley and mint leaves, peel the garlic cloves, and finely chop them all together. For the tahini, place 2 tablespoons of whole grain tahini in a bowl, along with a squeeze of lemon juice. 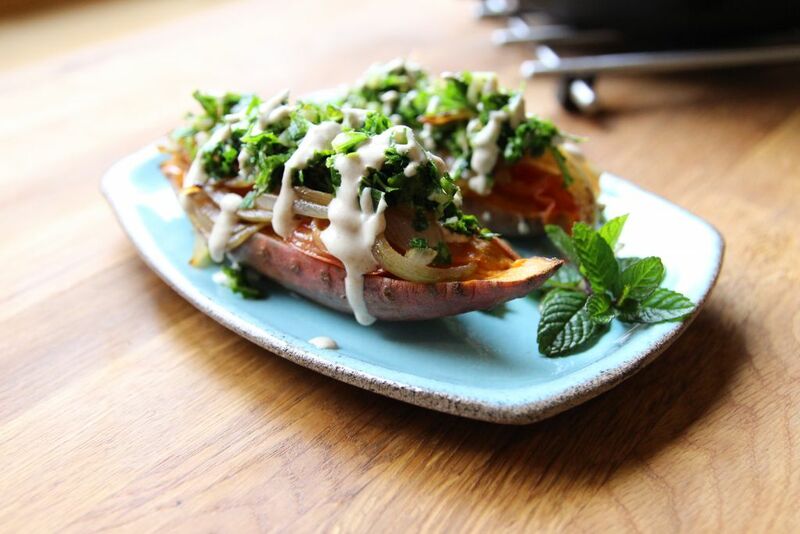 Slowly add in water, until you’ve reached the desired consistency of your tahini, then add a pinch of black pepper, and set aside, while we assemble our sweet potato boats. Evenly divide the tomatoes and caramelized onion, between the halved sweet potatoes, then repeat, with the freshly chopped greens. Finally, add a drizzle of whole grain tahini, and enjoy immediately! How about some Scrumptious No Bake Energy Bites for dessert? Only 4 ingredients! Let me know how yours turn out, I’d love to hear! Goodness me, these look delicious! I am partial to a bit of sweet potato. 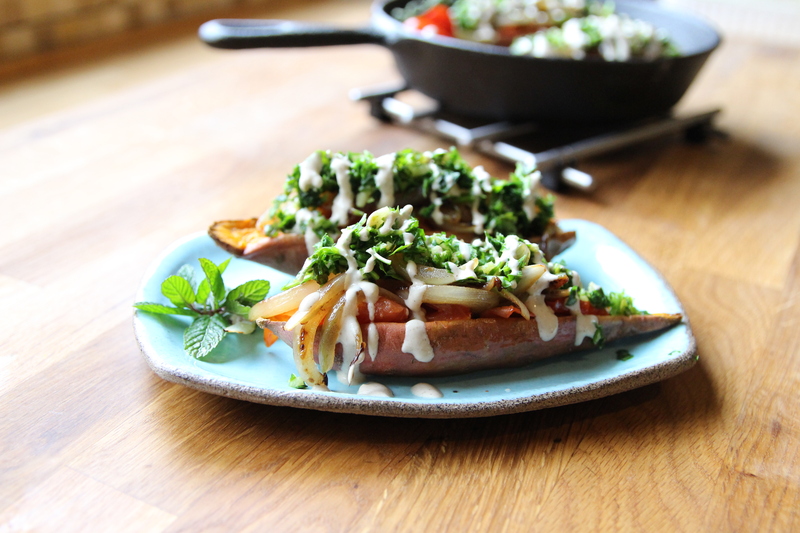 I love stacked baked sweet potatoes, they are so good and this looks like a real stunner. Wish I could tuck in right now, I haven’t started making dinner yet. Wow! Great photos and tasty sounding toppings! I’m always looking for new ways to dress up my sweet potato. They’re the best on weeknights! My husband would love all those onions! Sounds great!